The Cal Poly Mustang Ball will be held in Chumash Auditorium on the second floor of Cal Poly's University Union Building (Building #65) which is at the north end of Grand Avenue on the Cal Poly campus. Cal Poly is located in the city of San Luis Obispo, which is off the California coast approximately halfway between Los Angeles and San Jose. Cal Poly is less than 1 mile from Highway 101, which runs directly through San Luis Obispo. Google Map of the competition location and parking options. 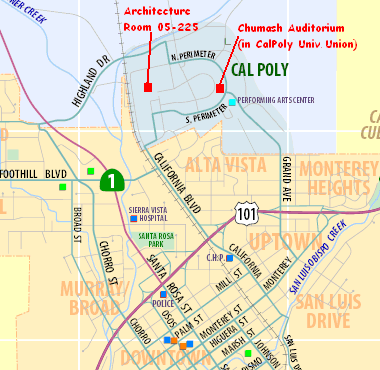 Interactive Cal Poly Map of the competition location. Continue up Grand Avenue until you get to the driveway on the left for the parking structure. Make a left and park in the structure. Walk up Grand Avenue until the street ends. The building in front of you to the left is the University Union. As you approach San Luis Obispo, exit at Monterey Street (the first exit in San Luis Obispo). Make a right turn, then an immediate left turn onto the frontage road (see map inset; you will be going the same direction as you were on the Fwy). Parking is free on weekends in the majority of parking spaces on campus, including spaces that are marked General, Staff, or Sponsored Guest. Parking meters are also not enforced on weekends, unless otherwise noted. Do not park in Service Vehicle, or loading zones at any time. The best place to park for the competition is the Grand Avenue parking structure. It is normally free to park in this lot. However, on some evenings they will set up event parking and charge $6 to enter the structure. If you are already parked in the lot, you may stay without paying a fee. If you have any questions about parking at Cal Poly, please contact Cal Poly Public Safety at (805) 756-2281.